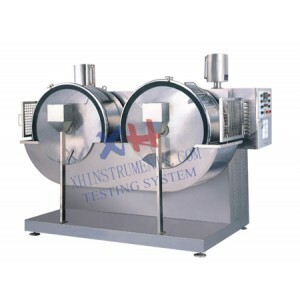 The interlayer heating & circulating stainless steel temperature-controlled comparison experimental drum is essential laboratory equipment in modern leather-making industry. 1.The equipment is equipped with the advanced interlayer electric-heating & circulating system. The liquid inside the drum is totally separated with the heating medium in the interlayer of the drum so that the drum can be heated and maintained at a temperature when it is stationary. 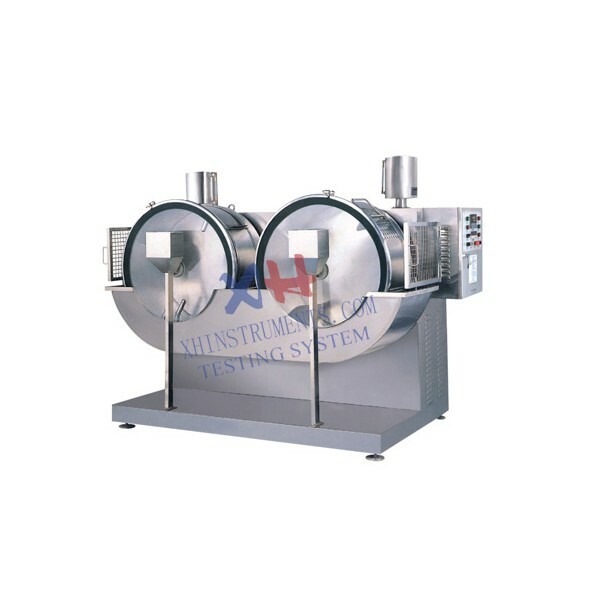 It is especially suitable for test at low ratio of liquids. All test date are accurate. The inside of the drum can be cleaned thoroughly so that there will be no any residual liquid and west residue remained. As a result of that, color spot or chromatic difference can be eliminated completely. 2.Speed of the drum is regulated by means of frequency convertor through belts.It has advantages of stable drive and low noise. 3.This equipment is equipped with two driving systems. The speed of each drum can be set up respectively. Either of the drums can be stopped operation. ﻿4.The equipment has the timing functions of controlling total working cycle time, forward & backward rotation duration as well as single direction operation. Each duration can be set up through timer respectively so that the drum can work continuously or interruptedly. 5.Equipped with an intelligent temperature controller, automatic heat, constant temperature hold and temperature control can be achieved accurately. 6.The observation window is made of fully transparent, high-strength & thermostable toughened glass so that process clean. 7.There is cleaning door and dredge through so that wastewater can be discharged into the tough that makes the process clean.